Last week I was pleasantly surprised by a beautiful Valentine's Day gift from my husband. He knows I not only love McQueen, but chartreuse is my favourite colour. 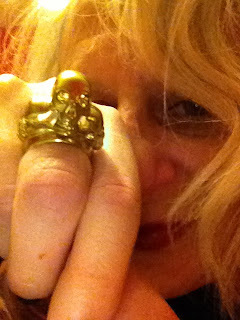 Imagine the glee when a chartreuse tri-skull ring was my gift! Perfection! I've been dying for good crepes, somewhere along one of our moves I lost my good pan so haven't had luck making them (and they are so easy to make either sweet or savoury.) He found a local creperie that was casual but oh so delicious! Buckwheat crepes for supper, and my fav sucre, beurre, lemon for dessert. I cleaned each plate which is a first for me as I usually eat loads of small meals. And the dinner crepe was really packed! Definitely have to go back! Also on Valentine's Day I re-did my hair pink. 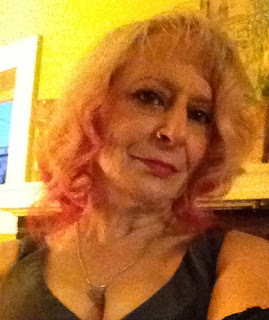 The pics don't show it too well, but the light parts are light pink. The only thing I dislike about light pink is that it fades so fast. I am quite in love with the darker pink "New Rose", and keep adding a little more each time the spirit moves me because it's so pretty! Valentines Day, hair colour didn't show that well though. Tried to show that I did my nails to match my ring! I also tried my hand again at the no-time bread I wrote about last week. Better luck this time, but I still must be doing something wrong as the crust is just too hard. It was perfect for breaking up into the vegetarian vegetable soup I made though! 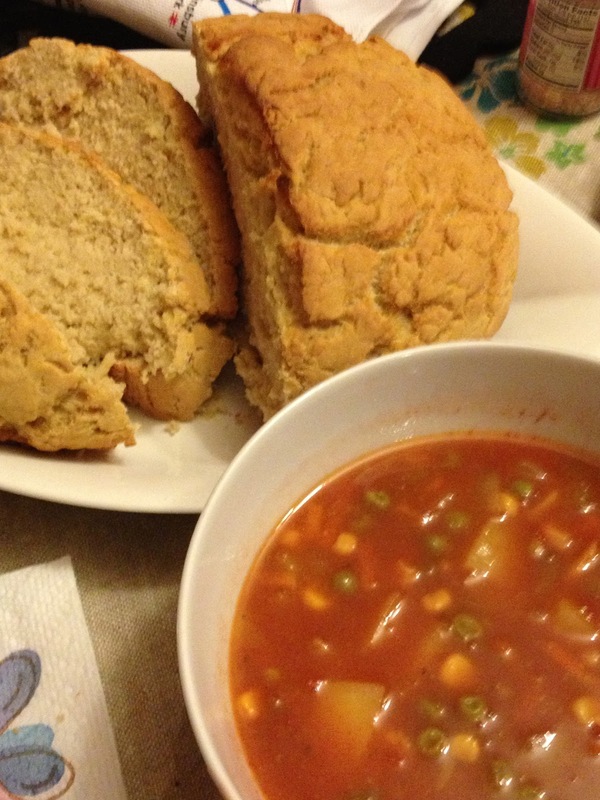 No-Time Bread and Homemade Vegetarian Vegetable Soup. 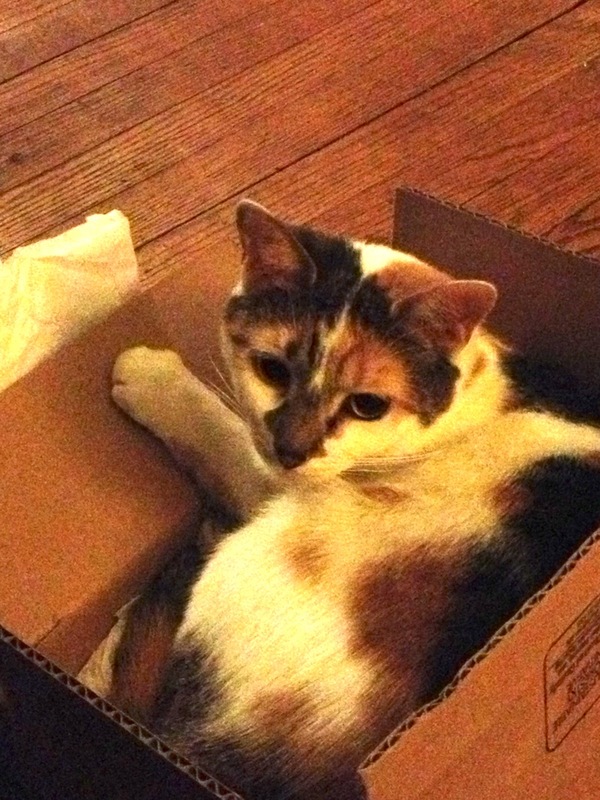 Lastly, kitteh pics. You buy these kids all kinds of toys and what amuses them most? 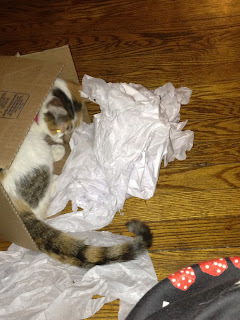 A box with tissue paper. Kids today! PS for those interested, the werewolf hat came out looking too wonky, like its ears were the wrong size. So I took them off and have a happily toasty warm hat! 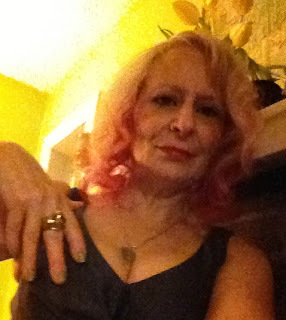 Great hair, great ring, great skills that husband! And every time I read your blog recently I end up craving soup and bread! Thanks Lakota, he's a keeper! (; Its so bloody cold here and I love making soup when its like this. So I make homemade soup at least once a week. A big pot so we can have leftovers for lunch on a blizzard day! Bread is my downfall, cheese too. I better figure a way to stockpile it for the zombie apocalypse as I might die without it! heehee! 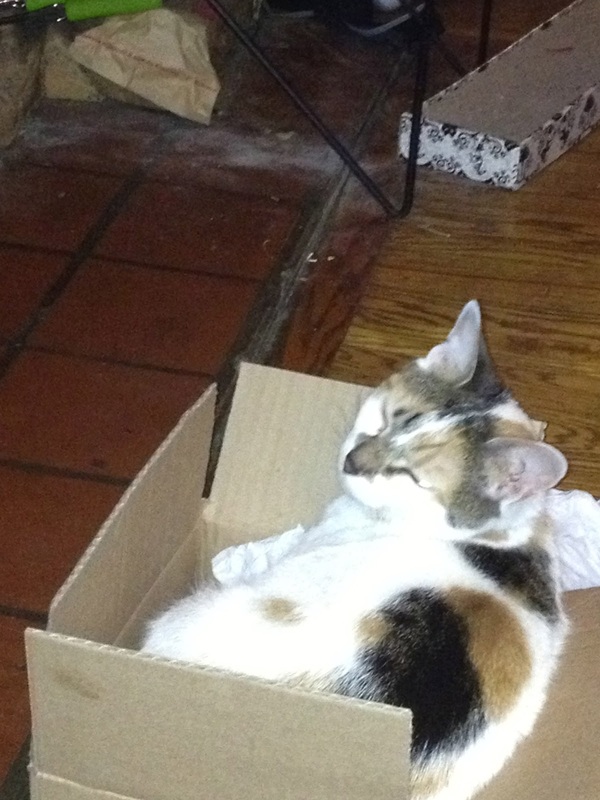 What is it with cats in boxes! O, the darling little pookie! I am cat mad, and am endlessly entertained by their shenanigans! That ring is to DIE for fabularse, darling! Nice one, hubby! That ring is gorgeous and your hair rocks! I had an awful savoury buckwheat pancake at a vegan joint in Goa and it put me off them for years, I should have a go myself, no crepe pan but my 25 year old wok usually does the trick. More pink hair please! I am DEVASTATED that all attempts to pinkify my hair have failed dismally (too much dark brown hair dye I'm afraid), so I must live vicariously through your magnificent head! wish you a wonderful rockin weekend darling! 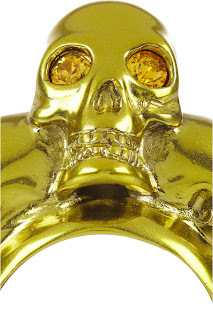 Awesome ring! I've been noticing your little icon photo as you comment on blogs. Love it!! That ring is a keeper! And so is the husband! Glad you had a great V-day- your face is a sweetheart of one, and deserves much loving! 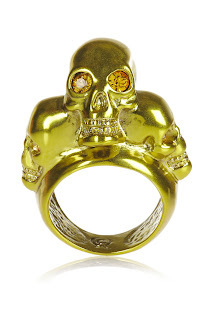 The ring the ring wow I'm a bit obsessed with all things skull but this is a stunner! So nice to also meet a hot pink haired woman in my age bracket:). You are a lil darlin with those soft pink curls! Crepes make me weak in the knees, savory, sweet I will eat them all.